We’d love your help. 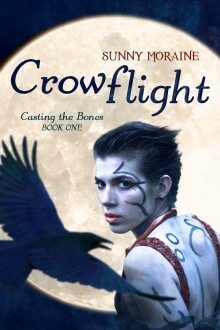 Let us know what’s wrong with this preview of Crowflight by Sunny Moraine. Turn is a member of the ancient Crow tribe, a Psychopomp in training—a guide of souls into the lands beyond death—with a bright future ahead of her, until she witnesses the suspicious loss of a soul between worlds. Accused of losing the soul herself, Turn is exiled to the Shadowlands beyond the Crow’s city, lands occupied by the mysterious and secretive Raven tribe, weaver Turn is a member of the ancient Crow tribe, a Psychopomp in training—a guide of souls into the lands beyond death—with a bright future ahead of her, until she witnesses the suspicious loss of a soul between worlds. Accused of losing the soul herself, Turn is exiled to the Shadowlands beyond the Crow’s city, lands occupied by the mysterious and secretive Raven tribe, weavers of dark magic and suspected by Turn as playing a role in her exile. To ask other readers questions about Crowflight, please sign up. I've been looking forward to reading this for ages and I was certainly not disappointed. You're plunged straight into a world that's built so beautifully and delicately, a world that is not only believable, but so easy to see because of the care that goes into it. The history of this world that's woven into the storytelling is wonderful and I found myself wanting to know more of the history, more of the past, why did these things happen. The stories meant to supplement th Man, this freaking book. I've been looking forward to reading this for ages and I was certainly not disappointed. You're plunged straight into a world that's built so beautifully and delicately, a world that is not only believable, but so easy to see because of the care that goes into it. The history of this world that's woven into the storytelling is wonderful and I found myself wanting to know more of the history, more of the past, why did these things happen. The stories meant to supplement the main plot are just as interesting, just as fascinating and I'm already looking forward to the sequel so I can hear more about this wonderful world and these incredibly interesting characters. One thing that has always stood out to me in Sunny's writing is their fantastic use of language and the way they appropriate words you wouldn't necessarily think to use in this context, but they always fit. I love the little details, even simple things, such as the use of 'chick' as an endearment. It lends a very real feeling to the entire bird motif. I was excited reading this book. The entire time, I was just plain excited, which for me, is why I read. I want to be swept away, to be transported and this book does that. I couldn't stop reading, I never wanted to put it down and I didn't want it to end. I won a copy of this in an author giveaway, and didn't know if I would like dark fantasy, but this really connected with me. It gets past the darker-than-thou tropes and turns out to be a well-written and original story. I'll read my free copy of the second book soon, and gladly buy a copy of the third. The book is very... dark. Literally dark, taking place in a shadowy world where the only light is moonlight. The people are divided into three corvid tribes: crows, ravens and rooks. It's a shaman I won a copy of this in an author giveaway, and didn't know if I would like dark fantasy, but this really connected with me. It gets past the darker-than-thou tropes and turns out to be a well-written and original story. I'll read my free copy of the second book soon, and gladly buy a copy of the third. The book is very... dark. Literally dark, taking place in a shadowy world where the only light is moonlight. The people are divided into three corvid tribes: crows, ravens and rooks. It's a shamanic world, and that shamanism has been split three ways: crows act as psychopomps, ravens perform magic, and rooks are in charge of justice. But there's one tribe missing, extinct because of their own pride and ambition. My sense is that this tribe's absence indicates some missing piece of magic that will need to be recovered, to make their world whole. We'll see if this prediction plays out in the next two books. The writing is excellent. The editing isn't. There are way too many typos and edit-os. There are a lot of things to love about this novel, but what I loved best was the depth of the worldbuilding, the subtle details that made a fully realised world. One of the plot points I generally like the least—and I say this only to give context to my reaction—is unjust accusations, because I find it stressful to even read about, but it is used to excellent and necessary effect her; it's not a cheap ploy but essential not only to the plot but to the world, to understanding the situation and t There are a lot of things to love about this novel, but what I loved best was the depth of the worldbuilding, the subtle details that made a fully realised world. One of the plot points I generally like the least—and I say this only to give context to my reaction—is unjust accusations, because I find it stressful to even read about, but it is used to excellent and necessary effect her; it's not a cheap ploy but essential not only to the plot but to the world, to understanding the situation and the political and historical background to everything. Another thing I will always love about Sunny Moraine's writing in general, be it their novels or short stories, is the way I always feel represented in the diversity of their characters (which is a thing less common than I wish it was, and always appreciated). Too many books fail to make me care about the characters so I was pretty happy to find myself invested in Turn's adventures. Around the 25% mark, I was seriously pissed off at the unfair things happening to her. I stayed hooked after that, waiting for her to have a chance to deal some fiery justice. I also very much appreciated the original setting and world, built around a society given the responsibility to ferry souls to the afterlife. I do hope we'll see a little more of our world in the seq Too many books fail to make me care about the characters so I was pretty happy to find myself invested in Turn's adventures. Around the 25% mark, I was seriously pissed off at the unfair things happening to her. I stayed hooked after that, waiting for her to have a chance to deal some fiery justice. I also very much appreciated the original setting and world, built around a society given the responsibility to ferry souls to the afterlife. I do hope we'll see a little more of our world in the sequels. I want to know how it looks like to Turn's eyes and whether she's going to interact with it further. Really enjoyed the worldbuilding in this, and I'm very much looking forward to picking up the next 2 in the series. It pulls off very well the fantasy trope of having evocative names/references (eg, the Carrion Kind being Rooks, Crows and Ravens) while also not leaning on cliche and finding new twists to add to what the reader may expect. The characters are engaging - it's very easy to empathise with Turn as she begins to learn more about her people's history and her own personal history, and the Really enjoyed the worldbuilding in this, and I'm very much looking forward to picking up the next 2 in the series. It pulls off very well the fantasy trope of having evocative names/references (eg, the Carrion Kind being Rooks, Crows and Ravens) while also not leaning on cliche and finding new twists to add to what the reader may expect. Pretty good. I would have bought it except it's priced at 4.99, which is too high for me unless the book is amazing.